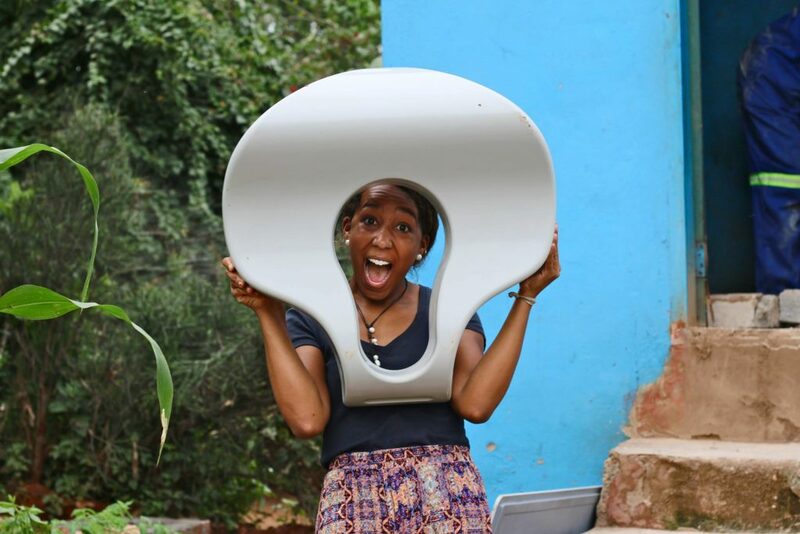 Jasmine Burton holding the SafiChoo toilet seat during the Zambia pilot. Photo credit: Wish for WASH, LLC and Jasmine Burton. The United Nations General Assembly declared the 22nd March to be World Water Day in 1993. This day aimed to educate the international community about water related issues and be inspired to make a difference. Move forward 26 years and we continue to advocate these issues. As I sit here typing away, my thoughts turn to a recent conversation I had with an incredible girl entrepreneur whilst working in an upcoming exhibition. It is her story I want to share with you today. Jasmine has since led a successful Indiegogo crowdfunding campaign to support a pilot program in Zambia. “After securing funding, we manufactured, shipped, installed and monitored the newest version of the SafiChoo toilet in tandem with Water and Sanitation for the Urban Poor Zambia (WSUP) and the Lusaka Water and Sewage Company (LWSC). Ultimately, we were successful in implementing a 10-week beta pilot of a water-based pour-flush version of the SafiChoo toilet that was conducted in a peri-urban compound in Lusaka, Zambia. SafiChoo received positive feedback from the community and project stakeholders, which has led to an interest in scaling our toilet in the city. We have since piloted a dry, self-contained version of the SafiChoo toilet in a secondary pilot in a resettled refugee farming area of Atlanta, Georgia.” Wish for WASH are currently seeking funding for a market viability pilot. In the meantime, they have launched an educational arm to share their story and mission. Over 2 billion people in the world today lack access to improved sanitation. A total of 4 billion people lack access to safely managed sanitation. Many have no other choice but to use pit latrines or holes in the ground as toilets. They share these facilities with neighbouring communities and the pits end up overflowing. For some, these pit latrines may also be far from home. “People living in densely populated communities without sanitation facilities often have to resort to open defecation. This can lead to a host of both mental and physical health problems.” For example, women will wait until evening to use the toilet due to social stigmas and gendered expectations held by communities. This leaves them vulnerable to sexual assault and makes it hard for young girls to manage their periods safely. As a result, many girls end up missing school during their period every month or drop out completely. Jasmine wants to change this and Wish for WASH is working educate others about the impact poor sanitation can have. This is especially the case for women and young girls all over the world. I cannot help but think what an incredible girl Jasmine Burton every time I read the interview before me. Wish for WASH “seeks to bring innovation to sanitation through culturally-specific research, design, and education because #EVERYBODYPOOPS”. This mission has led Jasmine to develop as a product designer and WASH (water, sanitation and hygiene) practitioner so she can reach her goal. It comes as no surprise then that she seeks to continue to develop multi-sectoral work in the future. Keep an eye out for our upcoming Girl Entrepreneurs exhibition in the summer, but in the meantime, check out http://www.wishforwash.org/ to find out more about Wish for WASH.
You can watch Jasmine Burton talk about her approach to the SafiChoo toilet and explain how the result can improve billions of lives as part of a TEDxAtlanta at https://www.youtube.com/watch?v=4pzFVspHIYQ .